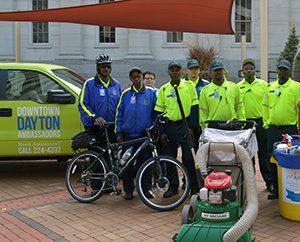 The Downtown Ambassadors are on the streets year-round, making your downtown a cleaner and safer place to be. The ambassadors are easy to spot, wearing bright “safety green” shirts in warm weather and bright blue jackets in inclement weather. Ambassador duties include picking up litter, power-washing sidewalks and removing graffiti. They also patrol on bicycles and on foot, serving as extra eyes and ears for the Dayton Police Department. Most importantly, they serve as goodwill ambassadors providing assistance to downtown visitors, workers and residents. If you have comments about the ambassador program you would like to share, please contact us. If you need to contact the ambassadors directly, they can be reached at (937) 224-4DDP. 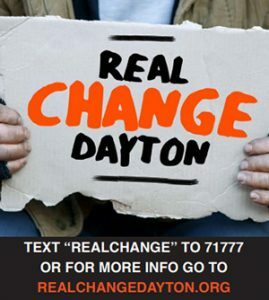 Real Change Dayton is a collaborative awareness program to address panhandling in the Dayton community. The primary focus is to educate the public on the resources already available that provide an array of services to those in need, including food, shelter, clothing and other support. The program also offers an alternative to giving spare change directly to individuals on the street. We work hard to make the center city an inviting place for downtown workers, visitors, and residents. In addition to the cleaning efforts of the Downtown Ambassadors, several other initiatives help add to downtown’s unique visual appeal. Since 2004, the First Bloom program has been bringing color and beauty to downtown Dayton each spring. First Bloom is a beautification program designed to enhance our streetscapes with colorful flower planters. The program is a partnership between the Wegerzyn Gardens Foundation, the DDP, and the City of Dayton. Volunteers from Wegerzyn fill roughly 100 planters throughout downtown each May. Participating property and business owners help maintain and water the planters. 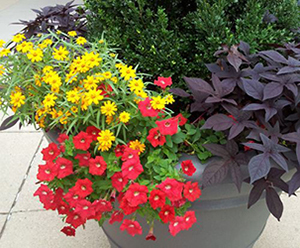 If you are a downtown business or property owner interested in planters for your property, call (937) 224-1518. Five new downtown murals have been painted on downtown buildings as part of the Urban Art Intersections (UAI) project. Created by the DDP in partnership with K12 Gallery & TEJAS and the Dayton Visual Arts Center, the initiative seeks to use public art as a way to connect local artists with the community and engage downtown Dayton residents, workers, and visitors with their city in a unique way, while enlivening downtown’s streetscapes. For the first phase, five small mural designs were selected from numerous submissions to be applied to downtown buildings. UAI is made possible with support from a grant from the Ohio Arts Council. UAI partners hope to secure funding to continue the project, adding more murals in the next phase. In addition, the City of Dayton is funding one more mural design for the Transportation Center parking garage across from the future Levitt Pavilion site. UAI partners are currently accepting proposals for the next round of downtown murals. Download the Call for Proposals document here, or find more information here. As you walk or drive through downtown Dayton, you’ll see colorful banners on many of the utility poles along our streets. 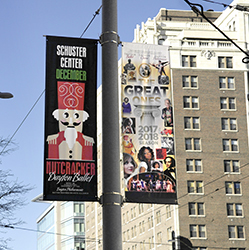 These banners provide an avenue for local nonprofit groups to promote upcoming events to the thousands of people who travel along our streets each day. For a nominal fee, any nonprofit organization interested in participating in this program can apply at least three months in advance using the downloadable materials provided here. There are a limited number of banner spaces available, so don’t wait until the last minute! Download these Banner Program resources, and email Colleen Turner or call her at (937) 224-1518 ext. 221 with any questions.